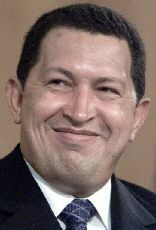 Hugo Chávez, April 30, 2002 (Photo: AFP). London The Guardian (liberal), April 15: For a deeply religious man...it was deliciously apt that [Venezuela’s] President Hugo Chávez was deposed on a Friday only to return in a miraculous political resurrection on Sunday....But he returns to lead a deeply divided country. His popularity has dwindled from 80 percent to 30 percent, and he has managed to alienate almost every sector of the Venezuelan society. His only support remains with the poor, although they have seen little improvement in their lives. Caracas El Nacional (centrist), April 15: This cruel week of April left us a broken country, spiritually bewildered, and filled with fears and apprehensions....May it be that from these tragic events has emerged a president who not only asks for criticism “loyally and honestly” formulated, but also is disposed to initiate a different stage in his government and in his style. May it bring about the democratization of his regime and the search for a broad dialogue...to achieve fundamental consensus. Venezuela remains wounded—it must not be left to die. Mexico City El Universal (conservative), April 15: The social sectors not in agreement with the policies implemented by Hugo Chávez can fight against those policies, but only within the framework stipulated by Venezuelan law. To try to do it by any other means is to enter into an area of illegality and political illegitimacy....A significant part of the failure of the attempt to overthrow the president was caused by the response to the insurrectionists from the international community, which refused to support or recognize a movement that had broken the constitutional framework. Guatemala City Prensa Libre (conservative), April 15: It would be tragic if Chávez were to consider his return to power as proof of absolute popular support, because then it would be impossible to doubt that the instability will continue, with political, social, and economic consequences. It must not be forgotten that before the (failed coup) movement, various mass popular demonstrations were held in opposition to him....The chief executive needs to begin a process to make amends and to achieve reconciliation, without which the lives of those who died will be a lamentable waste. Madrid ABC (conservative), April 15: Pedro Carmona’s main mistake in his short mandate was to trust in his forces and to believe that his decision to dissolve the National Assembly (democratically elected) would not meet a response. This was the beginning of the end for his project. Hugo Chávez, whose popularity had been waning in the last months, now faces the challenge of re-leading Venezuela, today more di-vided than ever, with a strengthened leadership; but [Chávez] also has an obligation to learn from the mistakes committed in the past, with double surveillance: that of the international community and that of his own army. Kingston Jamaica Observer (independent), April 15: The tension of the Chávez period notwithstanding, Venezuela has been a relatively stable democracy for 40 years. In a democracy, power is won in a ballot box after a campaign of argument. If you veer from these principles, except in the most extreme circumstances, the risk is a long-term destabilization of democracy. Democracy, after all, is not about which personality we, individually, like or dislike. It is about the will of the people. Rio de Janeiro Jornal Do Brasil (conservative), April 15: Latin America lives on the verge of a nervous breakdown. First in Paraguay, then in Ecuador and Argentina, and now in Venezuela: Presidents follow one another within a few hours, indicating the institutional instability of Latin American nations, as well as the gelatinous character of the societies that resulted from the transformations of the last few years, with their promises of stability and security. In Venezuela’s case, why did Hugo Chávez fall, why did he come back, and what energy can he still have to go on? Hugo Chávez was elected with 70 percent of the popular vote. He denounced—with reason—the country’s elites who, on a petroleum binge, dissipated the oil wealth...and failed to industrialize Venezuela or free it from the ups and downs of the oil market. Santiago La Tercera (conservative), April 14: What do the convulsions in Hugo Chávez’s Venezuela and Fernando de la Rua’s Argentina have in common?...What traits do those countries share with Peru, Ecuador, and Paraguay, for example? Governments with questionable legitimacy, shaky economies, social instability, evidence of official corruption...the same Latin American tragedy of the 1980s, albeit to a lesser degree. Havana Trabajadores (government-owned periodical), April 14: A historic journey culminated today in Venezuela with the return of President Hugo Chávez to his place at the helm of a reform process led by the Venezuelan people themselves. As thousands of Venezuelans remain in the streets to celebrate the recovery of constitutional order and the liberation of Chávez, the attempt to impose an extreme right-wing regime has been left in the dust.